I made pickles for the first time this morning. In life, I was pretty late to the pickle party only starting to eat them a few years ago. My philosophy was why eat home canned goods with vinegar (pickle) when you can have something with sugar (jam)? I seem to have a bit of a sweet tooth. I finally decided to make myself like pickles by eating them as my first bite when I was starving and then I got where I could tolerate them (almost) when they were hidden in food such as relish in tuna salad or a pickle chip buried in a sandwich. Your first starving bite is powerfully convincing. This went on for many years and now I actually enjoy pickles. I would never choose them over a cookie but I do not go into adolescent spasms when I encounter one. My favorite kind is Bread and Butter Pickles however I will eat dill, and sweet pickles. I honestly don’t taste much difference in the store-bought varieties but I can taste a difference in small batch pickles from county fairs. Usually the ones I find at fairs are super syrupy and sliced thin. Mine are thick and crinkly cut. 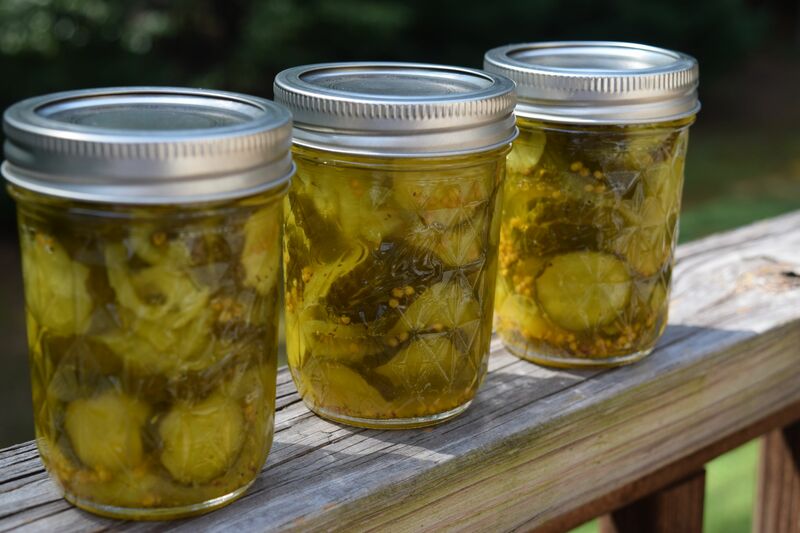 Also,making these today was MUCH cheaper than store-bought and waaaaaay cheaper than fair pickles. It would have been even cheaper had I grown my own cucumbers. So, I banished the dog, vacuumed the floor, pulled back my hair, wiped down the counters, washed my hands, boiled my jars, and heated the lids and bands — I was ready. A few hours later I had 14 jars of pickles. I look forward to tasting my first ever batch of Bread and Butter Pickles. In a Dutch oven, combine the sugar, vinegar and seasonings; bring to a boil. Add cucumber mixture; return to a boil. Remove from the heat. Carefully ladle hot mixture into hot pint jars, leaving 1/2-in. headspace. Remove air bubbles, wipe rims and adjust lids. Process for 15 minutes in a boiling-water canner. 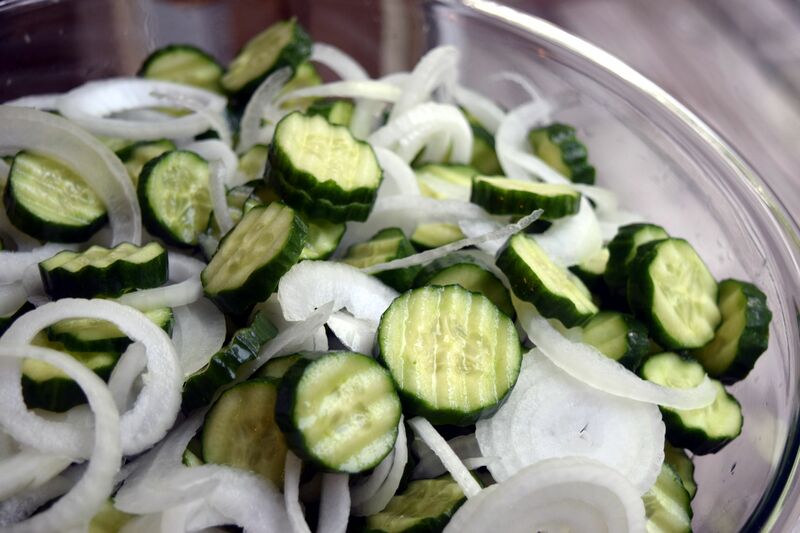 Slice cucumbers and onions. Be sure to cut off and discard the blossom ends of the cucumbers as they contain the most enzymes in them and enzymes hasten the decomposition of foods. 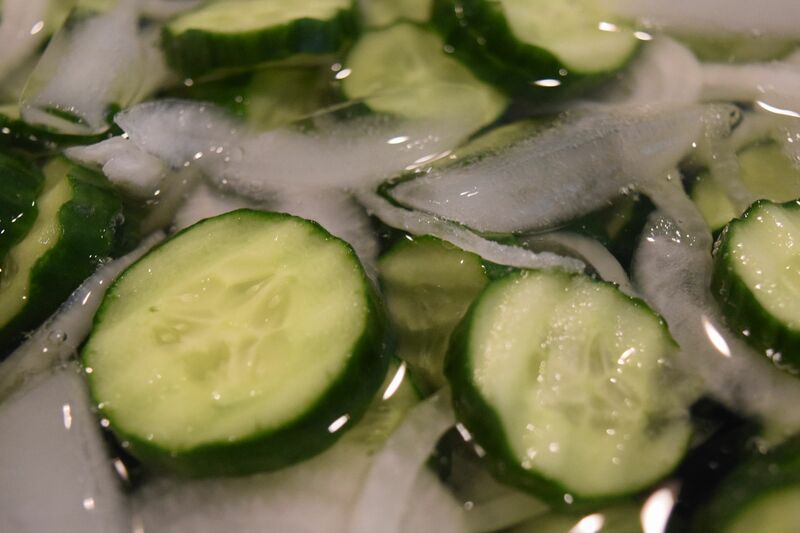 Soak the cucumbers, onions, and salt in ice water for 2-3 hours. Prepare your jars and lids. Meanwhile, bring the vinegar, sugar, and spices to a boil and boil for one minute. Add the rinsed and drained cucumbers and onions. Return to a boil. Pack vegetables into hot, sterile jars. Wipe the rims and screw on the bands. Process in boiling water for 10 minutes. Remove from the water and place on the counter to cool. 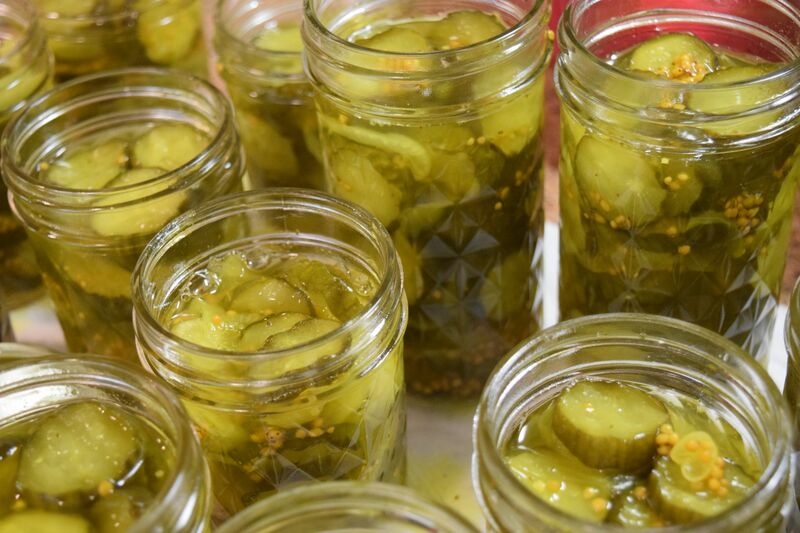 Store unopened jars of pickles in a cool, dark place for up to one year. Here are your pickle factoids of the day! Pickles have been around since Mesopotamian times in 2400 BC. Cucumbers are mentioned twice in the Bible Isaiah 1:8 and Numbers 11:5. And way back in the day in the Pacific Islands, pickles were fermented in the ground in pickle pits lined with banana leaves. They were seen as a sign of being able to provide for your family. Hopefully mine will taste good enough so I that my family will like them. Surely they will taste better than ones from an outdoor pit lined with banana leaves. I’m hoping so. 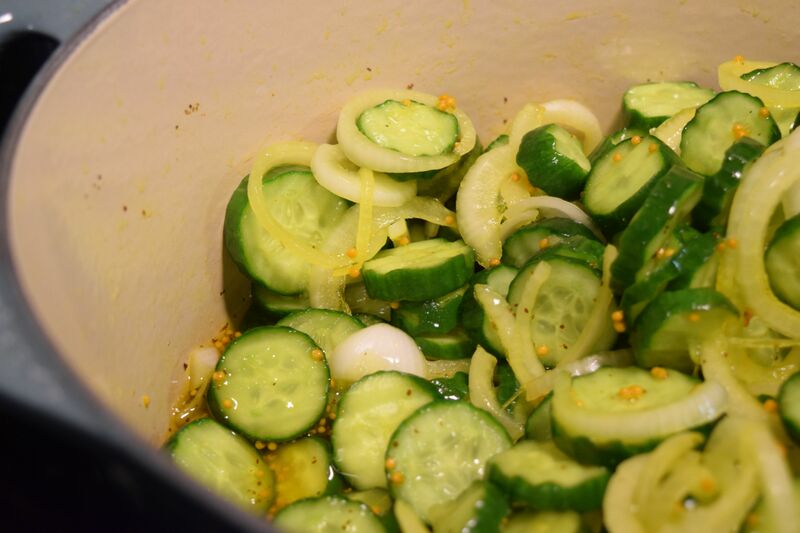 I used to make pickles also…had one recipe that required the pickles to be in a crock with vinegar, etc. 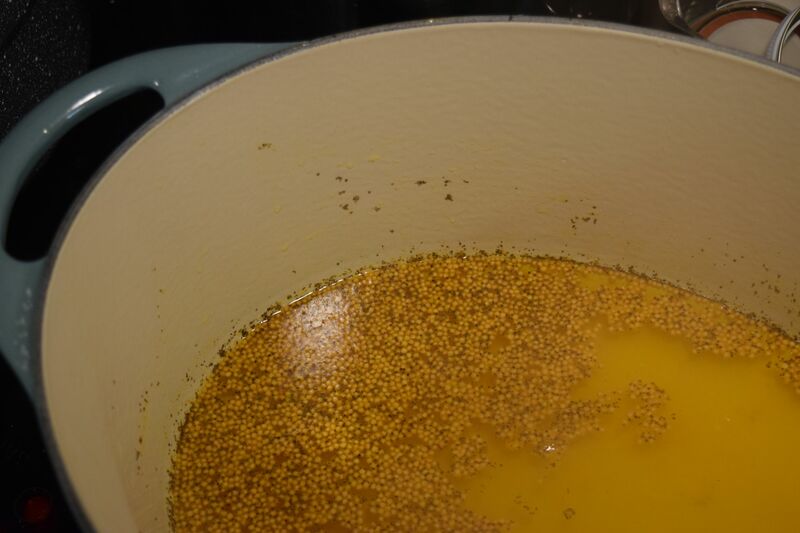 for 7 days….fun recipe. I helped make sauerkraut once in a crock. It tasted much better than the soggy canned variety. I need to buy my own crock to try it solo.